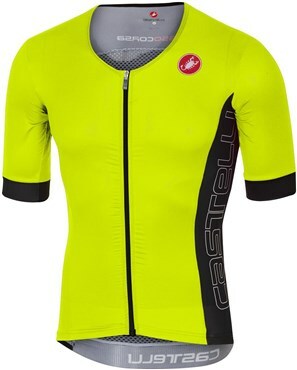 Keep cool while challenging the elements with the Castelli Free Speed Race short sleeve cycling jersey. The wind-cheating speed skin fit and Velocity fabric and Velocity mesh will let you slip through the wind efficiently. An anatomically shaped raw cut elastic is comfortable and the silicone waist makes sure it stays in place. Two pockets conveniently keep gels and nutrition for your endeavours. The top is lightweight and features UPF 16 and up sun protection so you’re well protected by cool at the same time. A SnapLock fastener makes sure you can connect to the Free Tri Shorts easily.